Photo Backdrops are the most effective and impressive display piece for big red carpet style events, providing a perfect opportunity for photographs. 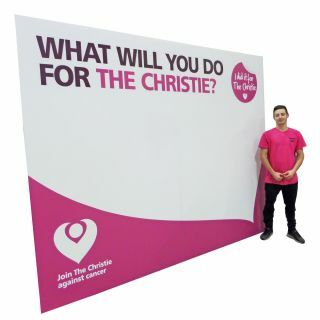 Backdrops can be designed to tailor your event or brand perfectly, step and repeat boards are an inexpensive way to promote your brand by getting your logo and company name featured in the backgrounds of images that will be used everywhere, from local publications and even on social media. We digitally print directly onto rigid foamex or foamcore with UV cured inks in full colour, for a high quality professional looking backdrop, without the worry of any reflective glare. Supplied with collapsible struts on the reverse, allowing for your boards to be easily set up and transported. Photo backdrops provide a great point of contact between the event host and attendee or volunteer, and as the name suggests they are a great backdrop to your official (& unofficial) photos of the event. Even though they look great printed to almost any rigid substrate, Foamex and Foamcore are usually the most popular for our clients. The photo backdrop can be as tall as 3m high. With a single piece width of up to 1.5m, if you’re looking for something wider, we can supply in multiple pieces with a joining strip, just drop us an email for a quote. What material is best for me? There are at least a few different board types we could use for printing backdrops. However, we recommend either 5mm foamex or 5mm foam centred board as the best options. Foam Core boards are very light, easy to move around and cheaper but they are also relatively fragile. Foamex is a hard, rigid and relatively heavy material and therefore recommended for regular or repeated use (especially for stands with head holes) to minimize accidental damage. We have produced some amazing stage props for theatrical productions. If you need any kind of stage props for your show or movie background (scenography), we can print any background boards/panels and cut them to any shape you may require. So far we have produced props such as buildings, city landscapes, trees and nature landscapes as well as people and characters. In cases where the maximum size of a sheet is smaller than your background we can split your artwork allowing you to position and piece it together on your stage. If your looking for something like a photo backdrop but with head-holes cut out (also known as a Tintamarresque, or faceless standee) please see our head-hole photo boards section . Foamex is a popular name for rigid, hard Foam PVC board, with brand names like Forex & foamalite. Foamex does not look or feel like foam material, it looks and feels like hard matt plastic. Will the backdrop out be suitable for outdoor use? Whilst the foamex board used for printing is in fact waterproof, the struts attached to the reverse aren't designed to be used on an uneven surface, or able to withstand wind. For this reason the backdrop would be best used indoors.